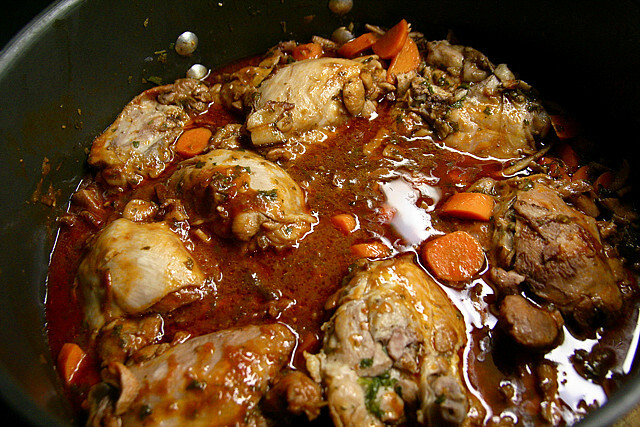 Classic French Recipe: Coq au Vin – Design Your Lifestyle. October 2013 Peter Salerno, Inc.
We’ve spent so much time over the last 2 months talking about the best in French kitchen design that we’ve started to get a little hungry. And what better way to nourish ourselves after a long trip through the French countryside than with a staple of French cuisine – a classic recipe for coq au vin? Popularized in the United States by Julia Child in both her 1961 cookbook Mastering the Art of French Cooking and on her PBS show The French Chef, coq au vin is a traditional French dish mainly comprised of chicken (or capon) braised with wine and prepared with mushrooms, onions, garlic, lardons, and seasonings. While the traditional wine in coq au vin is Burgundy, different regions of France use local wine varieties to create their own “twists” on coq au vin. For example, Alsace is known for their coq au vin Riesling. We thought we’d cap off the month of October – and our review of some stunning French design inspirations – by sharing a recipe for Coq au Vin, courtesy of the fine staff at SAVEUR. SAVEUR is the definitive culinary and culinary-travel magazine of its generation. It has been honored with four American Society of Magazine Editors awards (including one for general excellence) and 17 James Beard journalism awards. 1. Combine wine, chicken, yellow onion, and bouquet garni in a bowl; cover with plastic wrap, and let marinate in the refrigerator at least 4 hours or overnight. Drain chicken, onions, and bouquet garni, reserving wine, and set aside. Dry chicken thoroughly with paper towels. 2. Heat oil in a 6-qt. Dutch oven over medium-high heat. Add pearl onions, and cook, stirring often, until lightly browned and tender, about 8 minutes. Using a slotted spoon, transfer to a bowl and set aside. Add mushrooms to pot, and cook, stirring, until they release all their moisture and brown lightly, about 8 minutes. Transfer to bowl with pearl onions; set aside. Add bacon to pot, and cook, stirring, until it renders its fat and is crisp, about 10 minutes. Using a slotted spoon, transfer to paper towels to drain; set aside. Add 1 tbsp. butter to pot, and then season chicken with salt and pepper, and add to pot; cook, turning once, until browned on both sides, about 10 minutes. Transfer to a plate, and set aside. Add drained yellow onions to pot, and cook, stirring, until soft, about 10 minutes. Add flour, and cook, stirring, until smooth, about 2 minutes. Stir in reserved wine and stock, and then return chicken to pot along with bouquet garni; bring to a boil. Reduce heat to medium-low, and cook, covered and stirring occasionally, until chicken is tender, about 15 minutes. 3. Remove from heat, and stir in pearl onions and mushrooms. Divide among serving bowls, and garnish with rendered bacon and parsley.